Pasadena Playhouse, the State Theatre of California announced their upcoming 2010 fall productions. The doors will reopen with seven-time Emmy Award and five-time Golden Globe Award-winner Ed Asner ("Mary Tyler Moore Show," "Lou Grant") starring in the solo performance drama, FDR based on Dore Schary's Broadway hit Sunrise at Campobello. Ed Asner as FDR, presented by Pasadena Playhouse, in association with Campobello Theatre Productions Inc. and Gero Productions LLC, runs October 12 - November 7. Tony and Emmy Award-winner Leslie Uggams (Pasadena Playhouse's Stormy Weather and ABC's "Roots") returns to The Playhouse stage in Leslie Uggams UPTOWN DOWNTOWN. Presented by Pasadena Playhouse, in association with The Kelvin-Pratt Corp., UPTOWN DOWNTOWN runs November 16 - December 12 with the official press opening on Friday, November 19. Tickets for FDR and UPTOWN DOWNTOWN go on sale today. "My sheer joy at the fact that The Playhouse is resuming what we do best, which is producing great work on the stage, is tremendously heightened by the announcement that these two extraordinary artists will bring their incredible theatrical magic to our theatre. I have known and worked with them both over many years, and have shared a long term and especially rewarding relationship with Leslie at theatres all over the country, including The Playhouse," said Sheldon Epps, Pasadena Playhouse Artistic Director. "I know that our subscribers- and indeed theatre lovers from all over Southern California - will be entranced by Ed's brilliant incarnation of President Roosevelt, and swept away by the story of Leslie's own life and history as told through a glorious array of great songs, delivered splendidly in the distinct and magical Uggams Way. Once again, the lights of our theatre will glow, as they have so often in the past, with the tremendous energy that great performers bring to our stage." 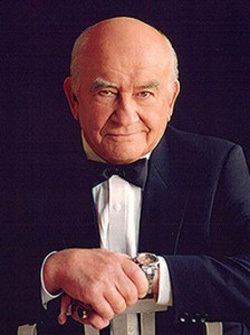 Ed Asner's New York City Theatre credits include: Ivanov, The Tempest, Face of a Hero, King Henry V, and Born Yesterday. Other theatrical credits include Woyzck, Volpone, Windoweis Houses, Dybbuk, Red Gloves, Murder in the Cathedral, Miss Julie, The Seagull, Peer Gynt, Juno and the Paycock, and Oedipus Rex. Additional television work includes appearances as a recurring guest star on the television series "Studio 60 on the Sunset Strip" and an Emmy Award-winning role as Captain Davies in the mini-series "Roots." FDR explores the life of one of America's best-loved presidents and the events and decisions that shaped a nation. This powerful play follows the iconic president as he reflects on his years in office, from inauguration to the trials of World War II. Leslie Uggams recently won an Audelco Award for her starring role in First Breeze of Summer at the acclaimed Off-Broadway Signature Theatre. She starred as the legendary Lena Horne in the pre-Broadway run of Stormy Weather at Pasadena Playhouse. Stormy Weather is Pasadena Playhouse's box office record-holder for advance single ticket sales prior to opening night and for the highest gross of an entire run. Leslie's Broadway appearances have included starring alongside James Earl Jones in On Golden Pond and co-starring in the Broadway hit Thoroughly Modern Millie. In 2001, her Broadway portrayal of Ruby in August Wilson's King Hedley II was nominated for a Tony Award. Hedley followed two other Audelco Award-winning, critically acclaimed Off-Broadway performances: The Old Settler and Keb Mo's blues musical Thunder Knocking on the Door. Leslie co-stars in the soon-to-be-released independent film Toe to Toe. Leslie Uggams UPTOWN DOWNTOWN is a dazzling musical evening with the legendary Leslie Uggams. In stories and song, Leslie recreates her extraordinary journey from uptown to downtown. From Mitch Miller to "Roots." From the Apollo Theater to Broadway. UPTOWN DOWNTOWN, featuring direction by Stormy Weather's Michael Bush and musical direction by Don Rebic, played earlier this year at New York City's Jazz at Lincoln Center. For more information and tickets, visit www.Pasadenaplayhouse.org.